I’m still learning about how to get the best results from Google Hangouts On Air – events that are broadcast live over the Internet. On Sunday, I hosted a Hangout On Air which ran pretty well. However, several features of the experience were disappointing. Here, I’m setting aside questions about what the panellists said. It was a fascinating discussion, but in this blogpost, I want to ask some questions, instead, about the technology involved in creating and broadcasting the Hangout On Air. That was the disappointing part. If anyone reading this can answer my questions, I’ll be most grateful. The problem was that the video uplink from my own laptop didn’t get included in the event. Instead of what I thought I was contributing to the event, the event just showed my G+ avatar (a static picture of my face). That was in contrast to situation for the other four participants. When I looked at the Hangout On Air window on my laptop as I was hosting the call, it showed me a stream of images recorded by my webcam. It also showed, at other times, slides which I was briefly presenting. That’s what I saw, but no-one else saw it. None of these displays made it into the broadcast version. Happily, the audio feed from my laptop did reach the broadcast version. But not the video. After the event had finished, I tried to reboot my laptop. The shutdown hung, twice. First, it hung with a most unusual message, “Waiting for explorer.exe – playing logoff sound”. Second, after I accepted the suggestion from the shutdown dialog to close down that app regardless, the laptop hung indefinitely in the final “shutting down” display. In the end, I pressed the hardware reset button. That muddle shouldn’t have arisen, especially as I had taken the precaution of rebooting my laptop some 30 minutes before the event was due to start. But it did. However, what made things worse is that I only became aware of this issue once the Hangout had already started its broadcast phase. At that time, the other panellists told me they couldn’t see any live video from my laptop. I tried various quick fixes (e.g. switching my webcam off and on), but to no avail. I also wondered whether I was suffering from a local bandwidth restriction, but I had reset my broadband router 30 minutes before the call started, and I was the only person in my house at that time. Exit the hangout and re-enter it, was the next suggestion offered to me. Maybe that will fix things. But this is where I see a deeper issue with the way Hangouts On Air presently work. From my experience (though I’ll be delighted if people can tell me otherwise), when the person who started the Hangout On Air exits the event, the whole event shuts down. It’s therefore different from if any of the other panellists exits and rejoins. The other panellists can exit and rejoin without terminating the event. Not so for the host. By the time I found out about the video uplink problem, I had already published the URL of where the YouTube of the Hangout would be broadcast. After starting the Hangout On Air (but before discovering the problem with my video feed), I had copied this URL to quite a few different places on social media – Meetup.com, Facebook, etc. I knew that people were already watching the event. If I exited the Hangout, to see if that would get the video uplink working again, we would have had to start a new Hangout, which would have had a different YouTube URL. I would have had to manually update all these social networking pages. I can imagine two possible solutions to this – but I don’t think either are available yet, right? There may be a mechanism for something like a URL redirector to work, even for a second Hangout instance, which replaces a previous instance. The same URL would work for two different Hangouts. 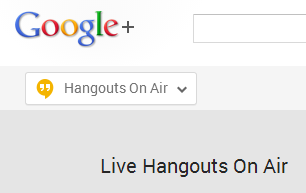 The URL of the YouTube window where the Hangout broadcast runs. As far as I know, all three URLs change when a Hangout is terminated and restarted. What’s more, #1 and #3 are created when the Hangout starts, even before it switches into Broadcast mode, whereas #2 is only available when the host presses the “Start broadcasting” button. To look on the positive side, one outcome that I feared (as I mentioned previously) didn’t come to pass. That outcome was my laptop over-heating. Instead, according to the CPU temperature monitor widget that I run on my laptop, the temperature remained comfortable throughout (reaching the 70s Centigrade, but staying well short of the 100 degree value which triggers an instant shutdown). I imagine that, because no video uplink was taking place, there was no strong CPU load on my laptop. I’ll have to wait to see what happens next time. After all, over-heating is another example of something that might cause a Hangout host to want to temporarily exit the Hangout, without bringing the whole event to a premature end. There are surely other examples as well. Thanks to Brian Hall, I’ve now got some answers! In particular, Brian showed me that I was too quick to jump to the conclusion that, when the host exits, the whole hangout shuts down. Instead, what happened in the several times that we tested this together, is that when the host exits, the live broadcast is suspended, but the hangout remains in place (so long as some of the participants are still in it). The host can rejoin and the live broadcast then resumes. We tested this with the host being absent for a full three minutes, before reconnecting, and the broadcast resumed. In my partial defense, I think the implementation of Google Hangout On Air is probably improving on a regular basis.